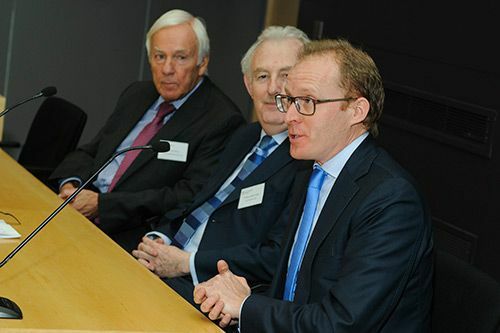 The documentary film, “Roger W Smith: The Watchmaker’s Apprentice”, was screened to a large and attentive audience at the annual George Daniels Lecture on 2nd December. 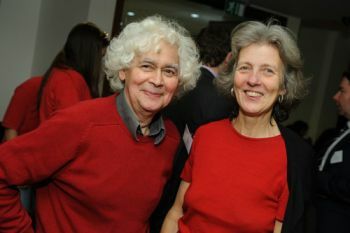 City University London’s annual George Daniels Lecture on 2nd December featured the screening of the documentary film, “Roger W Smith: The Watchmaker’s Apprentice”. Nearly 200 people filled the Oliver Thompson Lecture Theatre to watch the compelling chronicle of George Daniels’ emergence from Dickensian poverty to become one of the most renowned watchmakers in the world, paralleled with Roger W Smith’s dogged determination to be Daniels’ apprentice - a fascinating seven-year journey of disappointment and ultimate triumph. 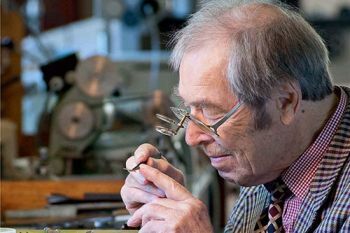 George Daniels CBE, DSc, FBHI, FSA (19th August 1926-21st October 2011) created the co-axial escapement, one of the most significant developments in watchmaking for the last 250 years and which has since been licensed to Omega. He studied horology at City’s predecessor, the Northampton Institute. After his death, the George Daniels Educational Trust administered the substantial funds he bequeathed to provide scholarships for City’s students and to benefit research in measurement and instrumentation at the University. After the film, Roger W Smith fielded several questions from appreciative patrons to the event. Along with the art and craft of the fine watchmaking exemplified by his mentor, Roger W Smith has inherited George Daniels workshop. He also employs a team of young apprentices who will ensure the longevity of the time-honoured tradition of hand-made mechanical watchmaking. 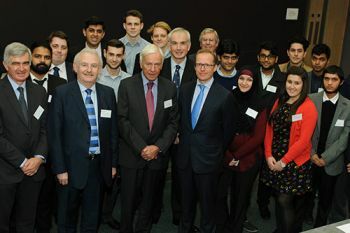 Currently, George Daniels' substantial financial endowment supports the George Daniels Chair in Scientific Instrumentation; the George Daniels Lecturer in Scientific Instrumentation; fifteen Undergraduate Scholars studying for degrees in Biomedical, Mechanical, Civil, Aeronautical Engineering and Mathematical Sciences; and three PhD studentships. Commenting on the very successful film screening held last Wednesday, George Daniels Chair in Scientific Instrumentation, Professor Ken Grattan, said: “This year’s George Daniels Lecture provided an excellent opportunity to learn more about the master watchmaker and the exacting standards he set in both his own work and in the training of his supremely talented apprentice, Roger W Smith. It was splendid to have both Roger and David Newman, the Chair of the George Daniels Educational Trust, present on the evening to discuss George Daniels, his work and his legacy to such a large audience here at City”. Filip Livancic, one of the 15 Undergraduate Scholars, and who is studying for an MEng in Aeronautical Engineering, is pleased to be a recipient of such a prestigious award. He has "benefited substantially from the George Daniels scholarship” and plans to follow a path into the engineering sector of the aviation industry. Henry Kirkbride, another George Daniels Scholar pursuing a MEng in Civil Engineering, is also grateful for the assistance enabling him to complete his studies at City. Kirkbride plans to work in project management on completion of his studies. Horology is the art or science of measuring time. Clocks, watches, clockwork, sundials, hourglasses, clepsydras, timers, time recorders, marine chronometers, and atomic clocks are all examples of instruments used to measure time. In current usage, horology refers mainly to the study of mechanical time-keeping devices, while chronometry more broadly includes electronic devices that have largely supplanted mechanical clocks for the best accuracy and precision in time-keeping.